Navigation About. GeeLance. Find me on Forbes.com Find me on Today.com Find me on Financial Planning Find me on Financial Advisor IQ Content. Workshop. Blog. Style. Misc. Day Jobs. Barron's. Wall Street Journal. I did this for fun to see what the world might think. It's raw, my voice is annoying AF and there's a lot of ums and whatnot. But if you're curious about freelance, it's got a few tips and is under 15 mins. so what the hey? On: Treasures. Excuses. And Time. Last week, a talented, beautiful soul left its body and slipped the surly bonds of earth. Its vessel belonged my 40-year-old cousin, who, along with her sister, I legit believe to be my first slumber party pals. She was a talented writer and musician. She could draw seamlessly. She drifted through her adult life due to circumstances outside of her natural control, but my concrete memories of her are fun, amazing and beautiful. Naturally, I also think of the things in my life that I always seem to put off til 'later on': the half-finished novel we all have sitting in a bottom drawer, calling my mom on the day I planned to, folding laundry and putting it away the same day it's washed, daily vitamins and supplements...and the list goes on and on and on AND. ON. All so surface but equally pulling at my attention. And over time, without discipline, the novel sits there, mom remains waiting at the other end for me to dial her up, laundry collects (like a BEAST) and the un-nourished body goes "why do you hate me so?!" and protests. Things were worse when I was living my life as office team player Grace. I was the one who worked while on vacation, and who didn't pipe up and defend myself. I took a lot of lumps to get where I did. And success followed. However, once I was loosed and took inventory, the environment wasn't pretty. I went without lunch breaks and skipped dentist appointments. I was exhausted and my free time was spent wondering where the light at the end of the tunnel might be. My family life underwent some serious renovations after I realized how absent I truly had been for the sake of getting ahead. I again blame a lack of discipline for this--I should have refused certain things, carved out time for myself and my family and pushed back where necessary. Mea culpa and point taken. This brings me back to my cousin. At the moment I learned she died, my life treasures, excuses and time bubbled up into my mind. There are things we can control and things we can't. Maybe it's time to bang out the work during the better half of the day in order to stay off social media and email during the sweet afterschool hours spent with my precious son. Maybe it's time to work out more regularly, cook more, take those vitamins, invest more in family and self improvement and less into what doesn't bolster them and push them ahead in a positive light. I've come to realize these tasks won't handle themselves and as one of the grownups in this equation, it's up to me to make things happen. And more importantly, maybe it's time to really assess what constitutes a true priority. Take inventory of our own treasures, excuses and time and whip them into shape. Because the truth is, nobody is getting out of this place alive. I think I favor the pursuit of a better life over leaving my weaknesses unchecked. This past week, something amazing happened. My business turned a whopping year old. The cover of my new notebook...courtesy of Muji and my love of lettering. It was a quiet celebration. Something I threw up on Facebook and Twitter so I could give shout outs to everyone who has carried me all this time. No cake. No champagne. No clown. But the thing is, I'm still pinching myself regarding the realness of this. A year ago, I suffered a layoff and decided to freelance (#GeeLance) for the summer. I was chasing my son in the yard wondering what September would bring in terms of a job search. I was hoping to potty train said son since I had farmed out so many cute (albeit less disgusting) rites of passage while I continued to work. I was terrified that the well might dry up, or that I might blow away. You're only as good as your last byline, right? As June 30 loomed this year, I got reflective, pensive: what were some of the things I wanted to do and hadn't? What were some weaknesses that needed toning and trimming? What were some lessons I still needed to grasp and fences I needed to mend or upkeep? I am the worst with time management--how did I do in that arena? Then, I ran the numbers--just how much did I pull last year? Bear in mind, I kept my son home with me and we did activities together whenever possible given my office freedom. Bear in mind, I finally got to know my new home because I had time to clean and look after it. Bear in mind that whenever there were parties or events at my son's school, he had a parent (meee!) present at long last. Bear in mind, every Wednesday, I swooped in and picked him up from preschool so we could spend the afternoon together and so he could get ABA therapy. With all the work/life/momaging I had to do, was it possible to live and earn anything close to my salary at the old gig? Oh, yes. You bet your bum it was! You better believe it! The difference is that instead of being chained to a desk, I float. Instead of spending day after day in an office, I spend day after day figuring out how to creatively manage my life and generate income. Instead of wondering where my promotion/recognition/raise might be, I do the gut checking. Its true that sometimes life gets in the way of assignments--but the right juggling can remedy that. I do believe. But if I've phoned it in, it's on me to make that right. 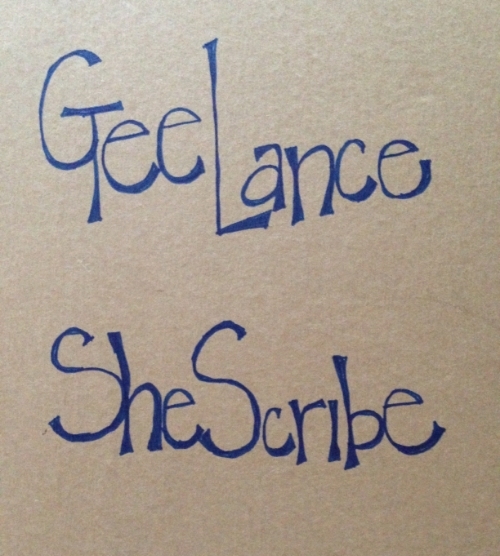 So happy birthday to you, dear #SheScribe--long live ya! This week, for the first time in ages, I didn't publish a byline. Laid-off me worried that I might break out in hives if I didn't see it somewhere, but as it turns out, here it is Sunday and I am alive and OK.
Don't get me wrong: after taking serious inventory, it turns out that I did a TON of other work related things. I filed stories, took assignments, edited upcoming pieces and set up interviews, but the byline didn't materialize. And, I'm OK with it. So, I took a nice, deep breath and thought it over. A lot of life happened this week. On Monday, the preschool called me to pick up my son because he was sick. Subsequently, he spent Monday afternoon and all of Tuesday with me. On Wednesdays, he comes home in the afternoon for therapy at our house. On Thursday, I had an emergency dentist appointment to deal with a popped out crown. Friday morning, I had macroeconomics class (more on that later) in the morning and during the afternoon, my son was home with me because his aftercare was closed. Can we also talk about how during this coming week on Monday AND Tuesday, the preschool AND aftercare are closed? Mazel Tov? Did I want to put a lot of time and effort (or worse, distracted time and effort, because let's just be honest about that--I was taffy pulled for sure) into something my editor was so-so about? But it presents another scenario that isn't easy. My contract with this publication is such that I must produce a minimum number of stories per month in order to get paid. The month is nearly half over and I'm coming up short in that dept. by skipping the meh story. But, I've decided I'm not keen on filing for filing's sake anymore. People take chances and risks on us for a reason and we owe it to them to be as solid as we can possibly be when we publish our works under their banner. I'm going to be working like a freak to hit my target for them this month, but I'm also learning to chill--to trust and to believe that everything works out for the best. The stories will come. If my son needs me, so be it--I'll juggle it all around and handle it--LIKE A BOSS! When I was at the daily grind, most mid-afternoon events like this were out of my wheelhouse. Now that I have time I can allot for things like this, I'm pretty excited to give them a shot. Full disclosure: I am a subscriber to the $10 per month Birchbox (as well as the IPSY Glam Bag) and have profiled the company in my professional writing life. So, when a pretty little invite showed up in my inbox the other day inviting me to come celebrate ARROW, their newest "athleisure inspired" line, I figured I'd jump on in. The event was hosted at MNDFL, a captivating space on 8th Street in the heart of NYU-land. MNDFL touts itself as "The Space to Breathe." From the moment I walked in, I was greeted by super friendly women dressed head-to-toe in athleisure gear (which, incidentally, everyone got in their gift bag--what?!?) We enjoyed a meditation session followed by a Q&A session and snacks with Chef Chloe and received amazing products. If this sounds like your dream setting, it is. Believe me. It is. But here is what I learned. I'm this independent reporter who's still a TOTAL scaredy cat! OOF! I had a sleeve FULL of business cards that went out and returned home with me. I really need to stop being a wallflower and network HARDER. I had an amazing chat with a couple of the women at the event and then--wait for it!--I got shy and found myself on (UGH!) my phone. MY PHONE! I was in a beautiful space surrounded by potential contacts that all shared the same goal as me: get that gift bag (I kid!) and the insulation of email, Twitter and FB won out. As I stood in the corner, and cheery chatter enveloped me, I decided to forgive myself for this weak moment, but then I asked myself: Grace, what are you afraid of here? Sure, there were younger, taller, skinnier women than me (I'm over 35 and a mommy who's 5'4 on a good day) but my lipstick was just as fresh as theirs. My outfit was just as clean as theirs. My intentions were just as lovely as theirs. So, is a room full of young, beautiful bright women really all that scary? Even if they're strangers? Grace, what are you afraid of here? And here's my deal: I've always been an outsider of sorts. A weirdo. And, painfully shy in certain situations. Despite wonderful friends, a loving family, a little success here and there--I was in a room full of beautiful people and because I didn't know anyone, I was horribly afraid of coming off as the awkward, weird, cryptic outsider. So, I stared at my phone rather than saddle up to people and dive in. And, I regret that. Yeah, for sure. The irony is that I was an outsider at that moment--but it was my own fault. Notes for next time-put the phone far far far away, let the armor down and work. that. room. Ok Universe, point taken. But, I'm still keeping my swag. ALL. OF. IT! That first day I returned to office following the news that "cuts had to be made" and one of those cuts would be me. Enter the well-meaning dude who wheeled a chair up and told me he'd been in my shoes before and, "Believe it or not, one day, you'll look back on it as the best thing in your career." Picture me gripping my mouse til my knuckles go white, blinking back tears, hostile-like, thinking: "Don't you mean best thing in your career? One less bit of dead weight for the team to carry around, right?" But, you see, I wasn't dead weight. The dead weight wasn't anyone's fault but mine, for I had let it creep in. It was the unspoken underutilized and overlooked situation I had created for myself--through things that were and weren't under my control. A dozen or so months earlier, I had been promised a move upward. It was very exciting and I waited happily. Then, nothing. A year later, I began to revisit and reevaluate what was happening, going so far as to flirt with leaving the team--and then autism knocked on the door, made its presence known as part of our two-year-old son's reality. Stopped me dead in my tracks. Killed ambition for the time being. It was reasonable to think that something like this could be revisited once things settled in my personal life. Reasonable because hey, the job was "safe." In the days that followed, I pushed in the clutch. My career/gunning/ambition anthem became work, collect a paycheck, don't make waves. There was a lot to process. I had flexibility. The health plan was good. The 401(k) match was outta sight. In an uncertain world, looking that stuff in the face and ghosting just wasn't my thing...so for another few months, I kept my head down and did my job. Produced output like a champion. But, it simply wasn't enough for the powers that be to defend keeping me when it all boiled down. Ouch! These days, when I think about it all, there are a few big things I would have done differently. Instead of skipping educational sessions in the name of my deadlines, or keeping silent in the name of being a team player, I would have carved out time to make sure I was learning as much as I could and fighting for myself as loudly as I could. Instead of letting things like the gym, the dentist, the facialist, etc., fall by the wayside, I would have taken the best care of myself possible. Rather than quietly sit back and coast, I would have been vocal, asked for meetings, demanded feedback no matter how difficult it might have been. Being cut loose has shown me that I'm my best advocate--so I'm not going to be afraid to ask upfront about what things pay. I'm going to speak up if the pay is short or the demand is too great for the compensation. I'm going to be confident, yet strive to avoid over promising and under delivering. I'm not going to be afraid to walk away from situations that abuse, confuse or don't enthuse me. I'm going to maintain healthy lifestyle choices and put them at the forefront of my mission so that mom is happy and everything else is happy too. Most importantly of all, being cut loose has shown me that opportunities are crazy rife. That what has held me back is pushing me forward now and that dude might even be right about this being the best thing that happened to me. After a beautiful visit from my mum, summer 2015 ended on a sweet note. The kid headed back to preschool and there I was, done with my season of "day adventures with kid" and wondering: is this freelancing going to continue or should I get out my resume and head to the LinkedIns? Amazingly, the minute I asked the Universe whaddup, two fantastic opportunities came knocking. They added a highly needed infusion to my fledgling Gee-lance roster and made me feel that holding off on a face time-centric day job won't be so bad for now. So, I am. Holding off. For now. Despite the small gig victories, there have been some interesting setbacks and gains as well. It still frustrates me when former contacts suddenly don't or won't know me, (love you sand pounders--call me! I'll return the favor but with oh so much glitter and sunshine your way. Promise!) but I'm getting used to shaking it off and moving along now. It was equally frustrating when some of my former sources appeared to have followed suit. It sucked. Huge. But, by the same token, generous colleagues put the word out for me and continue to do so. Some sources aren't scared away by my gmail address/citing "policy" and continue to send me their updates and database access. Incidentally, they end up in my stories as does their research--because that's the way this shiz works. And, some new sources I've made want very much to help me make my writing and reporting sparkle and shine like a diamond...we'll see! So, at the end of three months, I have to say that I'm excited to find out what is next. I'm grateful to have some of that (dead) weight lifted off from me and delighted to have found help and colleagues in the randomest and most wonderful places. At the end of the day, however, what mattered most to me is time with kid. Nothing compares. When you arrived yesterday, I was in the middle of chasing my son around the house and had to quickly sort through the mail in order to glimpse you in all your enveloped glory. Excitedly, I ripped you open and peered inside. There it was--a payment for moi. A beautiful payment for moi. The amount was tiny, but I don't care--you represent something far more important than the number of dollars scrawled across your beautiful belly. You represent the proof that I rose above what happened at my day job and that I'm going "somewhere." You represent proof that people think I'm good at what I do--good enough to get paid for it. STILL! You represent my dream, which I fought tooth and nail to get to, only to have it yanked away--you're proof that sometimes, it's wise to backhand that enemy and simply yank it back. When the days are shorter and the autumn bite is in the air, there will be time to pound away at the keyboard more and earn more. A cobbled patchwork quilt of abundance, I pray. But for now, I'll take you, paper check. And, I thank you. Hard to believe that it's been a month (plus) since my final day in the newsroom. Even better still, I finished July out nice and strong with three places to invoice for my work. The amounts came NOWHERE near what I pulled at my job when you take health insurance, pretax everything and the 401(k) match into consideration, but I'm fretting not. The point is I worked some. The point is I earned something. The point is I did what I needed to do and that's keep busy and keep going. This is the smallest bit of money I've earned in ages, but it's the most valuable, I think. Welcome to the last few weeks of my life. To say things have been different is putting it kindly--but I try to be kind at every turn of the road (often to my chagrin). When the carpet is yanked, it's hard to not take it personally: was it something I said? something I did? someone who didn't like me? It's also easy to armchair quarterback: why didn't I push to be promoted? was my remote situation what hung me? In fact, just typing this verbiage (all of which I allowed myself one week to ponder) is exhausting to my brain. Because I've decided that none of it matters in the end. The job is over and I can either suffer because of it or I can not suffer because of it. Don't get me wrong-I am by no means some hugely evolved person looking down from on high (nor do I consider myself to be one). I'm merely a mother and a wife and a me who has worked since the age of 14 and enjoyed pulling my own financial weight accordingly. I'm a me who touched down in NYC at the age of 19 with $50 and a dream that I was able to realize. I'm a me who comes from strong, stoic farm stock and managed to crack into corporate America, the Ivy League and the NYC literati. And I bled for it. But, this is also an opportunity. An opportunity to get creative, to stretch, to grow. An opportunity to fail and flop and flip. It's a chance I've never had in my career adventures--I can negotiate my own terms and my own path BUT with the creds to actually be able to do it. 1) PIMP YOUR CONTACTS--this was the smartest move I made and I did it the night I learned of my impending layoff. Why? Over the years, people come in who really take to you. Like me, you can have your quirks, but for some reason, they like you and that's GOOD. When your chips are down, you can call on them and they're often full of ideas and people they'd love to hook you up with. This also teaches you who really has your back and who can pound sand (POUND. SAND.) Also, note that this goes both ways--when you're called upon, don't be a stingy pants. 2) FEEL YOUR FEELS; BE CAREFUL WITH THEM GRUDGES--despite being burned a handful of times in my working life, (POUND. SAND.) I still think it's very important to keep your psychic self defenses up and simultaneously maintain openness. This is a fine dance--do you act natural and chat weather with the passive aggressive B*face who threw you under the bus? Do you smile and say 'Hiiii, how arrrrreeeee you?' Well, it's anybody's guess what you do, but I'm always partial to the sideways smiley meh face :/ while nodding gingerly. That said, there are people I'd about face and run in the other direction if I saw them and that's ok too. On the flip side, I have known people--not me, surely not meeee ;)--who were so hurt by what happened to them at work that they were hanging on long after the shelf life expired. To that, I say: it's still ok, but make sure you are at least trying to move on. Opportunity starts with O as in Get Over it--or something like that. 3) TAKE THE TIME IF YOU CAN--a friend of my family told me something very profound when I announced my layoff "take a BREAK. God has given it to you." I had to really chew on this because I love working. It's all I've known for so long and the idea of a break didn't sit well with me at first. Shouldn't I be frantically on LinkedIn firing off job applications and networking? Shouldn't I be at a career center and my school alumni office handing out resumes ? Shouldn't I? Shouldn't I? Shouldn't I? NO. Because that creates static and soft landings (if you're blessed to have one) are the anti static to cling to. 4) ANNOUNCE YOUR SITUATION ON SOCIAL MEDIA--I debated this one. Do I tell Facebook that my job is ending and I'm looking for work? The answer is HELL YES YOU DO! Remember that contact list I mentioned? It's there too. TRUST! 5) EVALUATE, SOUL SEARCH, REGROUP AND THEN MOVE ON--Part of the good that came from my self-outing on social media is that people reached out to me in droves. They had ideas and leads and encouraging words for me. They shared their own stories and inspired me. They helped me remember that I built this ship, and as surely as I built it, I could continue to guide it with a little elbow grease. They helped me understand that everything I've done up to this point wasn't for nothing. And, some of them gave this upstart former assistant job leads and recommendations. So, I'm a quest but I'm still soul searching. That's something I'll be doing for a while, I think--but with each key stroke, I am steering my boat away from the sad situation that was taken from me and the bright future I get to create. And, mahalo to that. Mahalo! Learn to standup paddle (SUP). Visit friend in Hampton Bays with kiddo. Add to this list like a rock star. Read some good 1950s era beach reads (A Summer Place, Gidget, The Best of Everything, etc). Find the gratitude in the moment.